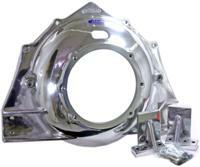 Engine Mounts: 133090 - Chev 181 - 502 Borg Warner,Polished Aluminum Bottom Starter Mount, Bell Housing complete with MTG. Brackets. from California Marine. Description Chev 181 - 502 Borg Warner,Polished Aluminum Bottom Starter Mount, Bell Housing complete with MTG. Brackets.